Welcome to the Primary Schools section of the Move Well Eat Well website! Join Move Well Eat Well by completing a Membership Form. Planning tools and ideas to help you get Move Well Eat Well off the ground. Website access - All Member schools receive a user name and password to access this site at their orientation session. Make sure all staff have it. If you have lost your school user name or password email us and we'll get them to you. 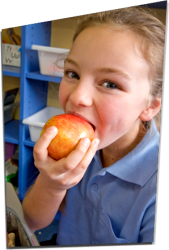 Find out who the 180 Move Well Eat Well Member Schools across Tasmania are. Make contact and share ideas! Find out what Tasmanian Principals say about Move Well Eat Well. There are over 80 health and community workers in Tasmania that have signed up to our Community Support Network with the aim of supporting Move Well Eat Well schools. If you're looking for a local supporter, drop us a line and we'll put you in touch with someone locally to give you a hand. We have a small team of Dietitans that are available to speak with staff or parents about healthy eating topics.If your school is interested, get in touch with us and we can refer you on to a Dietitian. We have a small team of Physical Activity Officers who are available to answer questions and provide information about physical activity topics. If your school is interested, get in touch with us and we can refer you on to a Physical Activity Officer. Your school may have kinder and early years programs for children in the 0-5 age range. Below are practical resources and information to help your school reach this age group with the Move Well Eat Well messages.